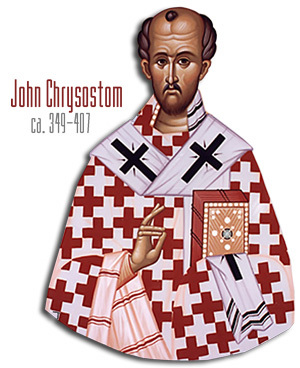 The great golden throated orator Saint John Chrysostom, was born into a Christian family in Antioch in 349. Shortly after his father died and his mother, a woman of great virtue, raised John in the faith. Baptized at the age of 18, John was tutored by the great Greek public orator of his day Libanius, but in 374 John gave it all up in search of a higher calling and retreated to the mountains to live the life of a hermit. Poor health forced him to return to Antioch where he was ordained a priest in 381. Utilizing all he had learned under the Greek master while incorporating the dogma of the true faith his fame soon spread and the faithful flocked to his Masses. This caught the attention of Pope Saint Siricus who appointed him to the influential bishopric as Patriarch of Constantinople. Throughout his life John was a fierce defender of the true faith against Arianism and received the name Chrysostom which means “golden-mouthed” in Greek. Like fellow holy doctors Saint Athanasius and Saint Basil the Great of his time, John was not only greatly cherished by the people, but also falsely accused by the Arians, in particular the Bishop of Alexandria who forced John’s exile. John knew, like Basil, that the people would not stand for this and thus he called the Arian bishop’s bluff by refusing to show up for the mock trial that would condemn him, much in the same manner St. Athanasius had done. Regardless, the Arian bishops unanimously decided to exile him. However John refused, claiming they had no authority and the Arians appealed to the Roman Empress Eudoxia who was moved to side with the Arians after hearing one of St. John’s sermons denouncing the pomp and luxury promulgated by the Roman rulers. It wasn’t until 403 that John was allowed to return by the Emperor Arcadius. However that was short-lived for, always loyal to Christ, John objected vehemently to the unveiling of a statue of the Empress Eudoxia who had exiled him. He did not object because of the exile edict, but rather the pagan nature attributed to the statue. Once again exiled, he would not return until posthumously carried back by the Emperor’s son Theodosius II thirty years after the saint’s death. While John spent his last years in exile orchestrating the missionary efforts of Lebanon, Syria and Persia as well as helping in the conversion of the Goths, he continued his campaign to be reinstituted as the rightful Patriarch of Constantinople. He wrote the new pontiff Pope Saint Innocent I who had been elected the 40th Vicar of Christ on December 22, 401. Though Innocent was in favor as well as the Constantinople citizens who would accept no one else other than John as their bishop, the new Roman Emperor Theodosius was stronger and more influential. Thus he sent John even farther away. John lived a total of 63 years, dying on the feast of the Holy Cross on September 14, 407 while enroute to the village of Comana near the Black Sea to preach. He received his Heavenly reward with the words “Glory be to God for everything. Amen” on his lips. He was pronounced a Doctor of the Church by Pope Saint Leo the Great at the Council of Chalcedon in 451, 44 years after his death. His most notable work The Priesthood is still very much applicable today, in fact, should be revisited in light of the terrible scandals of today’s clergy, many of whom have veered so far from their calling as chaste shepherds. St. John Chrysostom worte this treatise after his own ordination. The holy Pope Saint Pius X declared him the Patron Saint of Preachers. This holy preacher of the 4th century considered Saint Paul the Apostle the man he most wanted to emulate. He wrote, “The heart of Paul is the Heart of Christ!” John also wrote of what occurred during the Holy Sacrifice of the Mass, “many of the blessed ones coming down from Heaven in shining garments, and with bare feet, eyes intent, and bowed heads in utter stillness and silence, assisting at the consummation of the tremendous mystery.” Butler’s Lives of the Saints, in their reflection on this powerful preacher point out that, “We should try to understand that the most productive work in the whole day, both for time and eternity, is that involved in hearing Mass. St. John Chrysostom felt this so keenly that he allowed no consideration of venerable image to interfere with the easiness of hearing Mass.” Oh, where are the St. John Chrysostoms of today when we need them most? Sunday III Post Epiphany Jesus, our Redeemer, is God. He works wonders and the Angels of Heaven adore Him. Jews and Gentiles will be obliged to recognize His royal Divinity. All the world is obliged to recognize the Social Kingship of Christ as King of all nations. The Epistle of St. Paul to the Romans encourages us to make acts of faith in the divinity of Christ, that we may enter His Kingdom which prompts us to extend charity to all men for the sake of our love for God. This is manifested in the Gospel today by the two miracles our Lord performed. Just a word from our Savior cleanses the leper, whose cure, officially verified by the priests, “serves for a testimony of the divinity of the Christ”. Then we have the heathen, a Roman centurion, who obtains by his confidence, a great miracle: he testifies with humility that Christ is God. So great is this humility that the very words of the centurion have been employed by Holy Mother Church in the Holy Sacrifice of the Mass with the Domine non sum dignus at Communion time. We beseech Thee, O Lord, let Thy heavenly grace give increase to Thy Church, which Thou wast pleased to adorn with the glorious merits and the teaching of blessed John Chrysostom, Thy Confessor and Bishop. Through our Lord Jesus Christ, Thy Son, Who liveth and reigneth with Thee in the unity of the Holy Ghost, one God, world without end. Amen. Almighty and everlasting God, look with favor upon our weakness, and stretch forth the right hand of Your majesty to help and defend us. Through Jesus Christ, thy Son our Lord, Who liveth and reigneth with thee, in the unity of the Holy Ghost, ever one God, world without end. R. Amen. Behold a great priest who in his days pleased God. V.: There was not any found like to him, who kept the law of the Most High. Alleluia, alleluia. V.: Blessed is the man that endureth temptation: for when he hath been proved, he shall receive the crown of life. Alleluia. At that time, Jesus said to His disciples: You are the salt of the earth. But if the salt lose its savour, wherewith shall it be salted? It is good for nothing any more but to e cast out, and to e trodden on by men. You are the light of the world. A city seated on a mountain cannot be hid. Neither do men light a candle and put it under a bushel but upon a candlestick, that it may shine to all that are in the house. So let your light shine before men that they may see your good works, and glorify your Father, who is in heaven. Do not think that I am come to destroy the law, or the prophets: I am not come to destroy, but to fulfil. For amen I say unto you, till heaven and earth pass, one jot or one title shall not pass of the law, till all be fulfilled. He therefore that shall break one of these least commandments, and shall so teach men, shall be called the least in the kingdom of Heaven: but he that shall do and teach, he shall be called great in the kingdom of Heaven. May the holy prayer of St. John Chrysostom, Thy Bishop and Doctor, fail us not, O Lord: may it render our offerings acceptable, and ever obtain for us Thy pardon. Through our Lord Jesus Christ, Thy Son, Who liveth and reigneth with Thee in the unity of the Holy Ghost, one God Forever and ever. R.Amen. May this offering, O Lord, we beseech You, wipe away our transgressions, and make holy the minds and bodies of Your servants for celebrating this sacrifice. Through Jesus Christ, thy Son our Lord, Who liveth and reigneth with thee, in the unity of the Holy Ghost, ever one God, world without end. R. Amen. It is truly meet and just, right and for our salvation, that we should at all times, and in all places, give thanks unto Thee, O holy Lord, Father almighty, everlasting God; Who, together with Thine only-begotten Son, and the Holy Ghost, art one God, one Lord: not in the oneness of a single Person, but in the Trinity of one substance. For what we believe by Thy revelation of Thy glory, the same do we believe of Thy Son, the same of the Holy Ghost, without difference or separation. So that in confessing the true and everlasting Godhead, distinction in persons, unity in essence, and equality in majesty may be adored. Which the Angels and Archangels, the Cherubim also and Seraphim do praise: who cease not daily to cry out, with one voice saying: Holy, Holy, Holy, Lord God of Sabaoth! We beseech Thee, O Lord, that blessed John Chrysostom, Thy Bishop and illustrious Doctor, may approach to pray for us, that these Thy sacrifices may bring us salvation. Through our Lord Jesus Christ, Thy Son, Who liveth and reigneth with Thee in the unity of the Holy Ghost, one God Forever and ever. R. Amen. O Lord, as You grant us to use this great sacrament, deign, we beseech You, to make us truly worthy of its fruits. Through Jesus Christ, thy Son our Lord, Who liveth and reigneth with thee, in the unity of the Holy Ghost, ever one God, world without end. R. Amen. At that time, when Jesus had come down from the mountain, great crowds followed Him. And behold, a leper came up and worshipped Him, saying, Lord, if You will, You can make me clean. And stretching forth His hand Jesus touched him, saying, I will; be made clean. And immediately his leprosy was cleansed. And Jesus said to him, See that you tell no one; but go, show yourself to the priest, and offer the gift that Moses commanded, for a witness to them. Now when He had entered Capharnaum, there came to Him a centurion who entreated Him, saying, Lord, my servant is lying sick in the house, paralyzed, and is grievously afflicted. Jesus said to him, I will come and cure him. But in answer the centurion said, Lord, I am not worthy that You should come under my roof; but only say the word, and my servant will be healed. For I too am a man subject to authority, and have soldiers subject to me; and I say to one, ‘Go,’ and he goes; and to another, ‘Come,’ and he comes; and to my servant, ‘Do this,’ and he does it. And when Jesus heard this, He marveled, and said to those who were following Him, Amen I say to you, I have not found such great faith in Israel. And I tell you that many will come from the east and from the west and will feast with Abraham and Isaac and Jacob in the kingdom of heaven, but the children of the kingdom will be put forth into the darkness outside; there will be the weeping, and the gnashing of teeth. Then Jesus said to the centurion, Go your way; as you have believed, so be it done to you. And the servant was healed in that hour.